The graceful beauty and power of a husky barreling through snow shouldn't invoke feelings of suffering and torture. But every year since 1973, during Alaska's 1,000-mile Iditarod race in early March, hundreds are forced into a state-sanctioned nightmare. The Iditarod has long been controversial for its treatment of sled dogs. They're whipped and driven to run more than 100 miles a day in sub-zero temperatures. And while the power to keep those dogs safe lies with the State of Alaska, exemptions are actually in place precluding the dogs from protection under animal cruelty laws. "Last year, three dogs died. That is near the average for the Iditarod, and the causes of two of the 2008 deaths were quickly obvious," the Alaska Dispatch News reported the gruesome state of the race in 2009. "One dog was struck and killed by a snowmachine. The other had at some point during the race spit up intestinal fluids and then inhaled them. It was dropped at a checkpoint along the trail and flown back to Anchorage only to die here of what is called 'aspiration induced pneumonia.'" The dogs that aren't killed by machines are killed by the effects of hyperexhaustion as they burn over 12,000 calories a day, for 9 straight days or longer. Their bodies are later tossed into the dump. 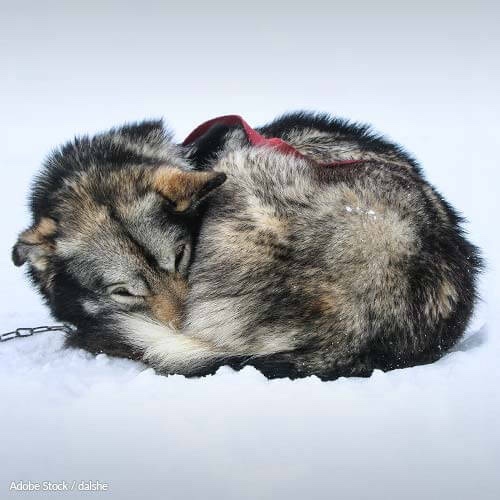 Sign below and tell the Governor of Alaska to remove the clause exempting competition sled dogs from its animal cruelty laws. There is overwhelming support by the people of your state and of the rest of the country, to end the needless deaths carried out every year at the hands of the Iditarod Race. The same animal cruelty protections afforded to the animals in our homes should be extended to the sled dogs of this race. There is simply no excuse not to. Governor, this is not how these dogs deserve to live, and I demand that the State of Alaska remove the clause exempting competition sled dogs from its animal cruelty laws. That's 25,988 signatures! Let's keep the ball rolling.